Specializing in health and fitness writing, Lance Fuller is currently interning for the National Education Association in Washington, D.C. Fuller was the first student to write about health and fitness for "The Independent Florida Alligator," America's largest student-run college newspaper. Fuller holds a Bachelor of Science in journalism, focusing on health and fitness writing, from the University of Florida. In many Asian martial arts, the color of the martial artist's belt denotes the wearer's experience and rank. In judo, a Japanese martial art that focuses on throwing and grappling, there are a combined 16 belt levels. There are six colored-belt levels called grades, and 10 levels of degrees for black belts. White is the universal color that represents a novice practitioner, while black represents an expert with varying degrees of black belts. The highest rank in judo is a 10th-degree black belt. In judo, colored-belt ranks are called grades, or "kyu" in Japanese, and black-belt ranks are called degrees, or "dan." There are six grades ranked in descending numerical order, with first grade being the last before promotion to first-degree black belt. There are normally 10 black-belt degree ranks in ascending numerical order, though there is no limit to the number of degree ranks. The colored belt system was introduced in 1935, when Mikonosuke Kawaishi began teaching judo in Paris, France. Depending on the country and the school's judo association/federation, there are different colored belt ranks for senior and junior members. White is the universal belt color that represents a novice or beginner. As the judo practitioner advances through the six grades, or kyu ranks, he will wear colored belts that include yellow, orange, green, blue, purple and brown. For example, the OBC Judo Club has its senior members wear a white belt for sixth to fourth grades and a brown belt for third to first grades. For black belts, sixth- to eighth-degree belts become red and white striped, and ninth- and 10th-degree belts are solid red. Judo practitioners are grouped by age, with senior members 16 and older and junior members who are mostly children. It is typical that junior members of judo progress through more colored-belt grades before they reach the first-degree black belt than senior members. In Brazil, a gray belt sometimes is awarded before blue. The U.S. Judo Association has 12 colored-belt ranks for junior members before first-degree black belt. 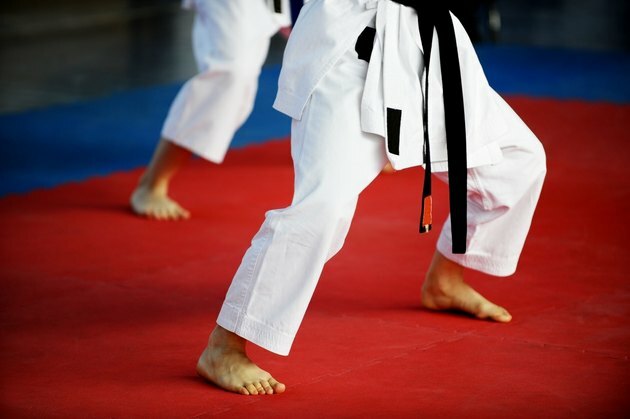 The belt system in judo is notably different than other Asian martial arts, such as karate and tae kwon do, in that its highest belt color is actually solid red, not black. While some of the modern martial arts, such as Brazilian jiu jitsu, are considered a refinement upon traditional judo and follow a similar ranking system in their belt colors, their system doesn't include the 9th and 10th dan solid red belt. Brazilian jiu jitsu begins with the white belt being a new student and the black belt the highest level. How Long to Get a Black Belt in Tae Kwon Do?